The Hunter Canyon trail is located in the Behind the Rocks area near Moab, Utah. The trail begins off of the Kane Springs Road and travels up a canyon for 2-3 miles, depending on where you decide to turn around at. The canyon is cooled somewhat by a perennial stream and towering redrock canyon walls. 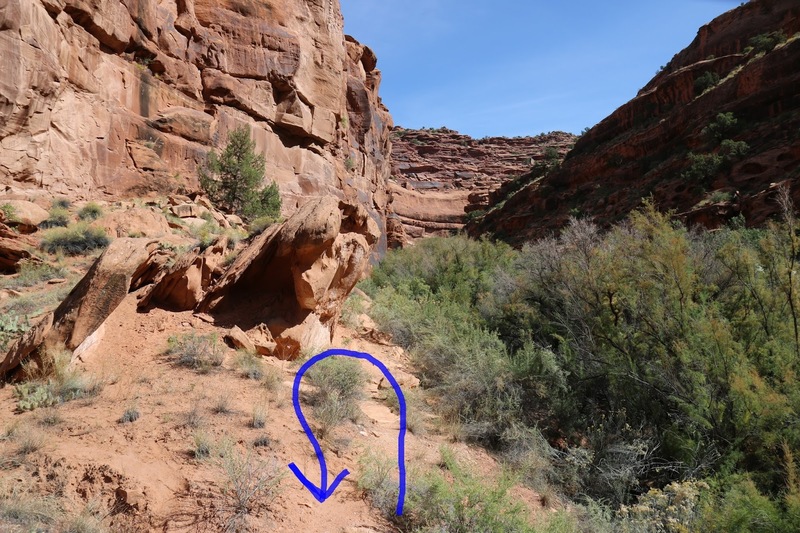 While in the canyon hikers are treated to views of Hunter Canyon Arch and a few petroglyphs scattered here and there. This is a great place for dogs to run through the water and for kids to have fun. The Hunter Canyon trailhead is 7.7 miles from Moab. Turn west off of South Main Street (Highway 191) in Moab onto Kane Creek Blvd. The first 4.6 miles of the road are paved as it parallels the south bank of the Colorado River. When the pavement runs out continue on the well maintained graveled road for another 3.1 miles. You will know you are getting close after descending several memorable switchbacks. Passenger vehicles seemed to be handling the road just fine up to the trailhead. There are 13 primitive campsites scattered around the mouth of the canyon and along the first quarter mile or so of the trail. A $10 fee is required for camping but not if you are only there to hike. Hikers are asked to sign the register that is located along the trail a few hundred yards from the trailhead. 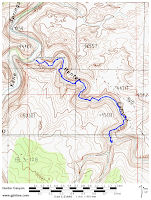 The map inside the trail register shows the hike going all the way to the same split in the canyon that we did for this post but shows the distance to that spot to be only 2 miles while our two GPS devices showed it to be 3 miles. 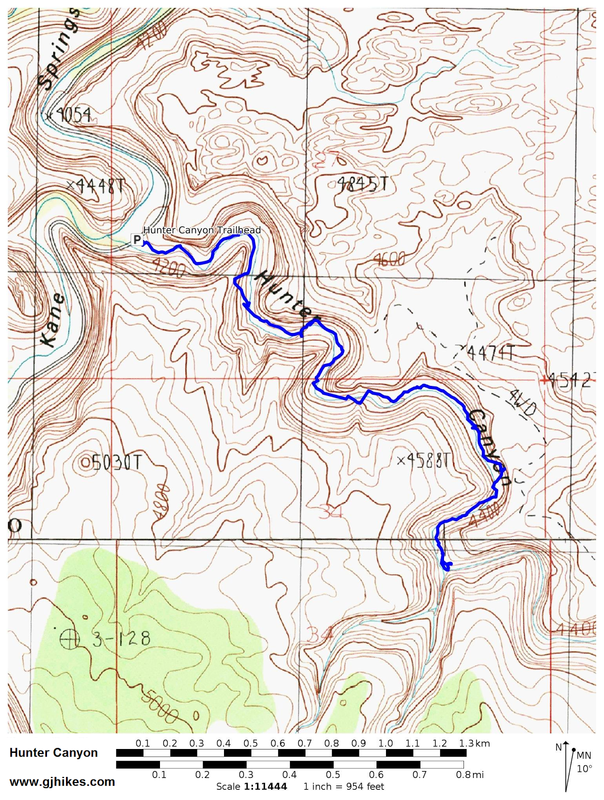 It would be best to bring enough water and trail snacks and plan for 6 miles round trip rather than to come up short. With a perennial stream there is a good growth of brush and grasses where the soil depth permits it. The trail gets enough usage that the route is easy to follow through areas like this thicket of gamble oak. The canyon is full of spots to have a picnic and that kids can have fun playing around. Hunter Canyon Arch comes into view about a half mile into the hike. It sits up next to the south rim of the canyon at an angle that makes it a challenge to see through its opening. The trail can be a little harder to follow across some of the slickrock and people tend to make multiple routes in those places. There are spots where you can see that hikers have come to huge boulders and scrambled over them rather than searching for an alternate route around them. While they may have had a lot of fun bouldering if you aren't up to doing that you don't have to. All the big rocks currently lying within the floor of the canyon have easy routes around them if you take the time to look. There are a couple of spots where it is easier to at least get the soles of your shoes wet than it is to navigate around them. Be sure to keep your eye out for poison ivy that is growing along the trail in a few places. Most of it isn't right on the trail so no worries unless you have to find some concealment for a bio break. The oil lingers on the stems and everything the plant comes into contact with even during the winter months when the leaves have fallen to the ground. As the trail passes by a huge alcove on the canyon becomes narrower and the stream area becomes clogged with multiple large boulders. A very easy trail on the left will take you past all of that. 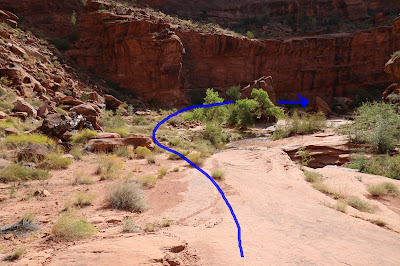 The easiest route after passing the boulders is to stay out of the streambed and follow the dirt trails that will lead around the bend in the canyon to the turnaround point. The common spot to turnaround is at a fork in the canyon. The right fork leads to a large spillover after a very short distance where the surrounding rugged cliffs present an exceptionally attractive scene. The left fork on the other hand is choked with a barrier of salt cedar that is much easier to turn your back on than try to hike through. Be sure to watch out for the scores of little froggies. The hike back to the trailhead goes by a bit faster than the hike up the canyon does. That is probably attributed to knowing the best routes after hiking the trail in. There is only about 300 feet of elevation gain on this trail so other than stumbling over a few rocks here and there it is really a pretty easy hike. Hunter Canyon is one of those places where the drive to the trailhead is scenic enough by itself to leave visitors satisfied even if they don't hike the entire trail. It is only about 1 mile round trip if you turn around at Hunter Canyon Arch. If you would like to see it for yourself then all you have to do is 'Take a hike'.